H. A. Swain delivers an adventure that is both epic and fast-paced. Get ready to be Hungry. Used to be, you could pick up things in the store and weigh them in your hand. Compare the different colors and shapes made by some hopeful person who had to guess what other people might want instead of having people decide exactly what they want before it's produced. Ho funny and upside down the world used to be. Wasteful, my mother would say. That's what led to all the trouble. Waste and inefficiency. 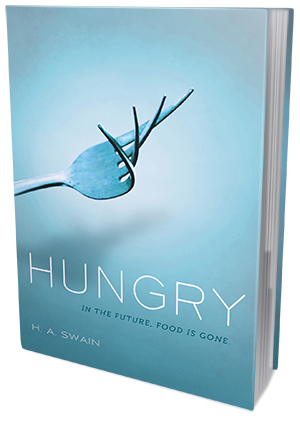 Hungry, though set in a not-so-distant future, offers a futuristic, semi-dystopian vision unlike anything I've seen before. From all the super advanced technology (like Gizmos, Holograms or HoverCams), to the many changes in humans themselves (eating habits, bodily functions, interpersonal relationships, etc...), it's a world so completely different from ours, it's at times overwhelming. "Remember our motto," says Yaz in a mock serious voice, "One World, One Big Human Family." The action of Hungry unfolds in a near future, and at times it's really hard to comprehend exactly how did things turn so bad so quickly. From what I gather, humanity managed to destroy the world almost completely. There are no animals left on Earth, no green plants, and no real freedom to do as you please either. There's no food, nor is there hunger for food or desire to enjoy food. Everything and everyone is constantly monitored - from your vitals and metabolism to your whereabouts. Even to have a child you need to enter something called Procreation Pool and get a match. There's no falling in love without Arousal added to your Synhamil, no meeting people at random. Everything is controlled by One World. Sounds scary? Oh, yes! I thought Heather Swain did a really good job with the world building. While there are some plot holes in the book (How could people give up their freedom so easily? Did they not try to put up a fight? How did things change so drastically just over two generations? How are they functioning with the Sun being obscured and fauna and flora completely wiped out? What about oxygen? There are literally tons of questions that come to mind as you read), the world itself is interesting enough to get you hooked and flipping the pages. Swain included enough detail to make the entire set up believable enough for the reader to get invested in the story. And, considering this is the first book in a planned series, there's still plenty of time to further flesh out the world and polish all the details. The worldbuilding is not seamless for sure, but it's far from being completely ridiculous either. And the idea of living in a world without food, as far fetched as it may sound, really works out great. I was skeptical about some world elements, yes, but at the same time I could not stop reading. And I'm definitely interested to find out what happens next. While I really enjoyed Swain's captivating, fast-paced writing style and the complexity of the world building, I can't say the same thing about the relationships in this book. Aside from one - between Thalia and her grandmother - I did not like any of them. Thalia's relationship with her mother is... weird. To say the least. Her mom is a scientist. And not just any scientist either, she is THE scientist. The one who helped refine the inocs and essentially got rid of hunger. The one who invented Synthamil, a nutritional beverage that keeps people from starving. That being said, Thalia's mom is kind of a control freak. A cold and heartless control freak, to be more precise. To the point that when Thalia admits to experiencing hunger, her mom gets her locked up in rehab. They both keep secrets from one another and generally don't get along well. ("Like I have to agree with everything she says just because she was instrumental in saving humanity.") I found their relationship rather sad. The insta-love between Thalia and Basil, however, is even worse. They get into fights often, quarrelling over just about anything. They go from completely in love and unable to live without one another to "I can't believe I liked this guy" in a matter of mere seconds. Now, I understand that these are teenagers we're talking about, and this is how most teenagers roll. Hot-hearted, passionate and acting on hormones rather than stopping to think for a second. And I think that Swain really did manage to capture the craziness of teenage love, I guess I just wished for more maturity and less irresponsibility in their actions. Instead, their relationship came off rather unhealthy, and I don't think that was the intention here. All things considered, Hungry is a captivating and thought-provoking story set in a fascinating world. A dystopian unlike anything else out there, filled with futuristic gadgets, innovative ideas and scary secrets. Tense and action-packed, it's a very entertaining tale with plenty potential for growth. And, come to think of it, it's kind of a magical story too, in that it really makes you look around and appreciate all the small things in your life that you'd usually take for granted - chocolate cake, grandma's hugs, meeting random people who turn out to be your best friends. I'm really looking forward to seeing where the author will take us next. Heather Swain lives in a crooked house in Brooklyn, New York with her husband, two children, a barkless dog, and two rescue cats. She is the author of four novels for young adults, two kids craft books, two novels for grown ups, and numerous short stories, personal essays, and non-fiction articles. Her newest YA novel HUNGRY is available now!